Unexpected Homeschool: What Are We Trying To Achieve? This past week was one of our scheduled breaks from book work. It was refreshing for us both to know that we would not be getting out the books for any formal lessons. Even during our week off so much documentable learning happens. I've been thinking about the unschooling, or delight directed learning, a lot this week. I recognize that as an adult that is the way I learn. Nobody sets a course of lessons for me to go about completing. When I need or want to know something, I research it and learn about it. When the mood or need is not there, I don't seek out new information. I also know that I had a great educational base to start my adult life. That base centered around planned courses that systematically provided me with enough information to continue my life of learning on any topic I desire. It also sparked in me a desire to learn about subjects that I never expected to be my thing - British history, for example. I'm freakishly into British history. How's that for a science person? I want all of this for Amber too. This doesn't mean that Amber must go to exactly the type of school I did. Yet, when I think back to my school days I've come to realize the public school I attended was quite different and gave us as close to a classical education as possible in a public school. (LEFT) This is what greeted us when we arrived home from co-op classes. That basketball goal withstood a tornado pass-by, but today's wind knocked it over. It is upright again (I'm Mighty Mom) and hopefully none worse for the wear. (RIGHT-BOTTOM) Finishing art class assignment. Using grids to draw a picture smaller than the original. I do want Amber to be taught the subjects she doesn't like because they have value independent of her opinion. I want Amber to find joy in topics that she never knew existed. I want Amber persevere in mathematics even though she doesn't love it in this phase, because she is spectacularly mathematically gifted and should not cavalierly toss that gift away. So, while these weeks full of learning without planned assignments are successful, I still am not, in any way, an unschooling parent and never will be. I will encourage Amber to seek out topics that interest her, but will also always be there with the planned lessons giving Amber the foundation that I too was so lucky to receive. If you made it this far, you might be asking what in the world brought on such thoughts this week. If you weren't, well, sorry. I'm telling you anyway. As it was a break week, there was no planned lessons. Just the plethora of activities that basically revolve around fine arts and confirmation class. 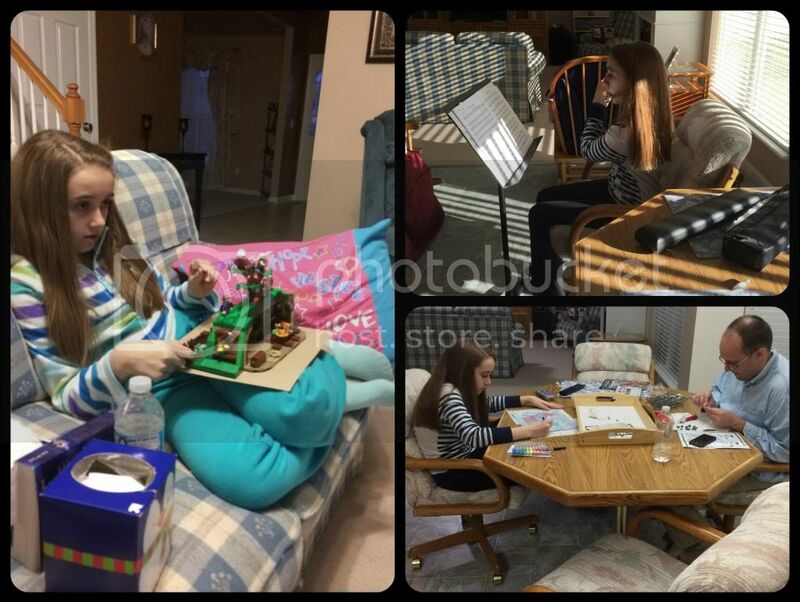 Unfortunately, Amber spiked a 102 degree fever with sore throat late Sunday afternoon. By Monday morning the fever had broken without intervention and the doctor confirmed it was viral. In accordance with our tradition around here, sick days mean vegging out on the couch watching long movies or miniseries. Amber chose the BBC miniseries North and South on Amazon Instant Video. She loves English historical movies. I love English historical movies. Fred does not enjoy English historical movies. Sick days are the perfect time for those movies. This particular miniseries has the added benefit of Richard Armitage. Amber wasn't thrilled with him in Robin Hood, but since portraying Thorin in the Hobbit, he has gone up in Amber's estimation. He should feel quite honored that she even knows his name now. Amber doesn't mind telling me when she is confused in historical movies. I learned this with the Jane Austen movies a while back. We spent quite a bit of time on Monday discussing, with the movie on pause, English industrial cities vs agricultural cities. We discussed the conditions and pay for factory workers, child labor, unions, poverty, how cotton weaving machines worked (I didn't even have to look that up), and the Church of England. We also talked about how one strike could ruin a company, what "speculation" was, the Exposition in London, and finally material used for clothing. (LEFT) Amber also watched the ENTIRE extended edition of The Hobbit: An Unexpected Journey, while playing with her LEGO Bag End. Would they hurry up, PLEASE, and release The Desolation of Smaug on bluray. Give a tired Mommy a break. (RIGHT-TOP) Practicing flute - carpet cleaners were here on Tuesday and we were stuck in the kitchen for a while waiting on carpets to dry. Much flute and art work was completed by Amber during this time. (RIGHT-BOTTOM) Carpets are dry, but Amber and Fred worked on their own artistic pursuits in the evening. On Tuesday Amber re-watched the BBC Pride and Prejudice and of course had more questions. These were mostly of the nature as to how we know what songs were used in dances, how do we know the dances still, etc. There were some idiomatic phrases too that she didn't understand and needed excruciatingly detailed definitions for. All of this made me think about how much Amber was learning on a sick day, simply because she was interested. Still how much more of either miniseries would she have understood if we had covered that period in history, properly, prior to her watching instead of the hap-hazard question answering I did during the movie? Our week can be summed up by saying it was a great learning week full of art, music, and history. It also made me slow down and really think about what our goal is for Amber's education. All of the activities, the doctor visits, general busyness and food anxiety can make us lose sight of our original intent. In the end this evaluation has only strengthened my resolve to adhere to the classical model for Amber's formal education. I'm sorry Amber was sick but it sounds like she learned so much anyway. That is what I love about homeschooling. We can each choose our own path and even then we don't have to 'stay' on that path. We can choose another one! Keilee has always learned so much from documentaries and historical movies. Happy Friday Christy!! I love your thought process. 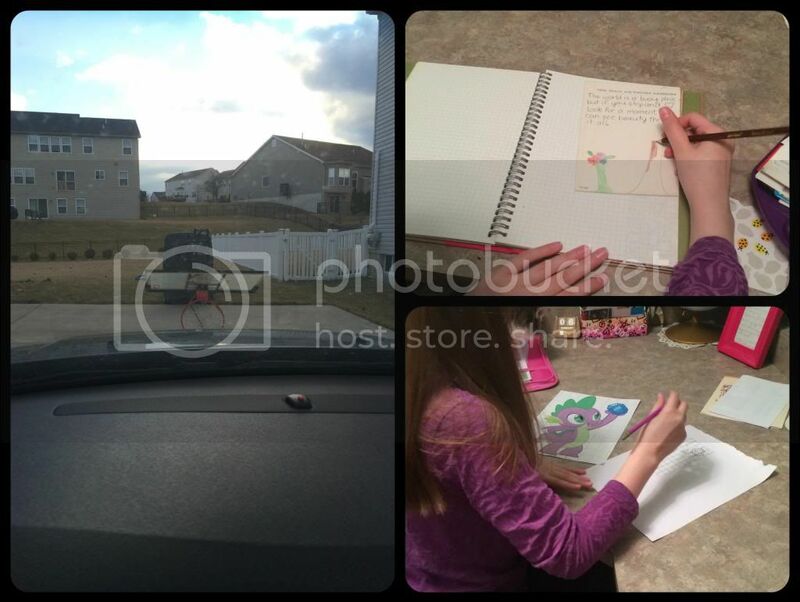 You are a natural homeschooling mom because your heart and mind are working so well to Amber's benefit. Sounds like a happy week to me :-) I think sometimes, when we slow down and notice what our children are learning without our interference, we will be astounded! I'm glad the fever wasn't anything serious. I think that there are some advantages to unschooling, and yet even so I do feel the need for more formal learning- especially in math. Our school district requires testing in Language Arts and Math so I would be doing my kids a disservice if I didn't make sure they could pass the tests. I have also been looking into the classical method. I recently read a review of the book, "Simply Classical: A beautiful Education for any Child"- including special needs children. I'm hoping to get it and learn more about using this method with Beth and Jerry. Both Philip and Margaret can go off on on tangents so quickly. I let them to some degree but they know that they still have to do all the other areas. If I let them run free neither would ever write another word. We do have some extra learning this term since Margaret is ahead in science. She is getting to play with programming through scratch and I may try to teach her basic website creation.